Hyundai has gradually established itself as one of the key players in the Indian auto market. While making their mark in the mass market, Hyundai has also successfully managed to sneak into the premium segments too. The Hyundai Elantra is revealing itself as one such success story. The Elantra was first introduced in India back in the year 2004. In 2012, Hyundai launched the new generation of the Elantra on the fluidic lines that started with their Verna. The Hyundai Elantra continues to bear the slender flowing dynamic lines endowed as per the fluidic design language. The front face comes with a two part radiator grille with horizontal slats and large swept back head lights that blend in with the front fender. The shoulder crease on the side profile of the car is prominent and complements the sharply raked wind screen and a coupe-like roofline of the sedan. The head lights now get daytime running lamps while the internals of the tail lights have been restyled. The Hyundai Elantra comes with one of the most feature-loaded dashboard design amongst its competitors. The console at the centre comes with a touch screen music system and navigation. The Elantra has one of the most comprehensive list of features with cooled front seats leading from the front. Cruise control, electrically operated and foldable wing mirrors, automatically dimming IRVM and rear AC vents are all a part of the long feature list. The safety of the passengers is taken care of by the four airbags, ABS and EBD along with the electronic stability program. The projector head lights are effective and pretty impressive too. The Elantra comes with two engine options – the 1.6 litre diesel unit and the 1.8 litre petrol unit. The 1.6 litre four cylinder turbocharged diesel motor is also found in the Verna and generates 126 bhp of power. It is coupled with a six speed manual gearbox and offers 22.7 kmpl of mileage and with the six speed torque converter automatic gearbox, it delivers 19.1kmpl of mileage. The 1797cc four cylinder petrol motor produces 147 bhp of output and is available with two gearboxes, a six speed manual and a six speed automatic. The manual version returns 16.3 kmpl and 14.3 kmpl respectively. 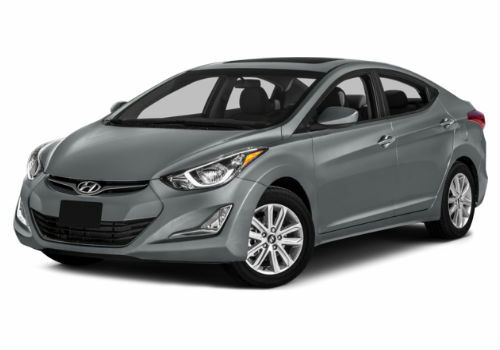 The Hyundai Elantra competes in the premium sedan class with its rivals like the Toyota Corolla Altis, the Skoda Octavia, the Volkswagen Jetta and the Chevrolet Cruze. With its class leading feature list and suave stance, the Elantra has turned out to be quite a formidable option.